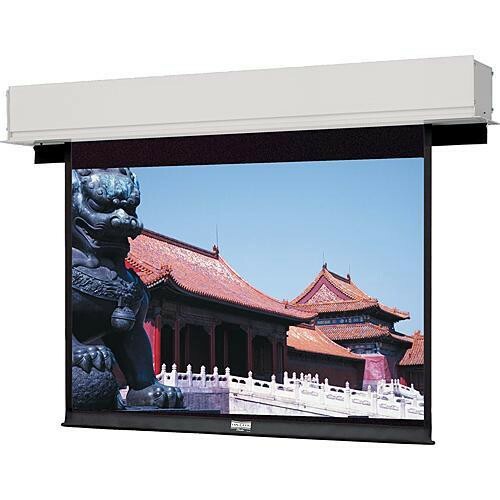 The Dalite 69 x 110" Advantage Deluxe Electrol Projection Screen is designed to have the case installed during the "rough-in" stages of construction and the fabric assembly during the finish stage. Its handsome white powder coated closure doors and case provide a clean look and allow easy installation of ceiling tiles. The Advantage Deluxe has a motorized trapdoor that opens and closes to let the fabric out. Note: This item is ONLY wired for 220V. The standard Advantage model will be ceiling recessed, it just doesn't have the motorized door. Instead, it has a 2" slot on the bottom where the fabric drops out. This item is ONLY wired for 220V. Box Dimensions (LxWxH) 136.0 x 13.0 x 10.0"